Although a native of England, James Brawn spent much of his early years learning and excelling in piano musicianship in both New Zealand and Australia. With numerous awards under his belt in the Southern Hemisphere, Brawn returned to the United Kingdom in 2010 where he continues to perform solo recitals in many of the prestigious venues inside metropolitan London as well as assisting in master classes with Stephen Kovacevich, Tamás Vásáry and András Schiff. James Brawn has taken a pedantic approach to better understand and explicate the great works by Chopin, Liszt and Beethoven. In early 2013 Mr. Brawn unveiled his first volume in piano sonata œuvres entitled, A Beethoven Odyssey. Warmly received by the press, he went on to complete the second volume, and the subsequent third volume was released last month. Prior to the Beethoven Volume III, we find here a potpourri of sorts inside James Brawn in Recital. A nice mixture of compositional variation, Brawn convinces us of how a pianist takes meticulous care in understanding a composer’s nuances. Here we have it all wrapped up in one CD: sensitivity, flexibility, respectful translation. If one has never listened to this gentleman’s expertise, then perhaps this James Brawn in Recital would be a great place to start. Bach brackets the front and back end of this well-recorded and acoustically impeccable MSR Classics issue. The Chaconne, creation by Johann Sebastian Bach, was so inspiring to Ferruccio Busoni that in 1893 he paid homage to the Baroque master by creating his own arrangement. Inside the composition we find Mr. Brawn’s well-delineated detail of crisp and tight lines, each note struck on the keyboard with fine stamping. He makes each note seem as if it is the most important one found on the staff. Franz Liszt’s works can be daunting to any pianist, especially when faced with the capricious, devilish dialogue found within the Mephisto Waltz. But James Brawn has complete command of interpreting the Lisztian sens de la répartie in commendable fashion. His fingers float nimbly across the keyboard in arresting fashion; the music is splendidly colorful and sprite-like. His effort appears effortless, careful to take cautious pauses with the rests, all which helps elicit a Faustian flair in a wildly difficult composition. Likening to Chopin’s Nocturne, N° 8 in D-Flat major, the ensuing Liszt piece contained within the Consolations, S. 172 has Brawn making the most out of the beauty of Liszt’s movement with pensive, lyrical grace. 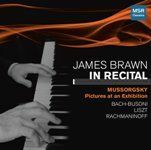 Most people can better identify with the fully orchestrated version of Mussorgsky’s Pictures at an Exhibition; therefore, listening to James Brawn tackle the 10 movement piece is quite the treat. The pacing is thoughtful, never rushed, yet rushed where it need be. The piece makes Viktor Hartmann’s paintings piquantly come to life. This is a fine example of learning how dynamics play such an integral role in musically describing visual art. More somber in scope, Rachmaninoff’s Prelude in B minor is a composition that allows the pianist to express his own lucid intensity. Brawn convinces us with his power and beauty in the keys that Sergei Rachmaninoff likely would have relished. Mr. Brawn possesses convincing display of these selected works. The artistry, the drive and the energy found within his fingers translate onto the piano in an overtly dignified manner.